Last season, Davidson did not have a single new player get playing time. Bob McKillop brought in three players for the 2015-16 season: one, a transfer, had to take a redshirt year, and the other two sat out the season with injuries. However, all three of the aforementioned players are back, and along with the addition of freshman Jon Axel Gudmundsson, the new-look Wildcats are off to a good start to their 2016-17 campaign. With Jack Gibbs nursing a shoulder injury, the brunt of the point guard duties fell to Gudmundsson for Davidson’s opener against Appalachian State. The freshman was up to the task, logging 11 points, 5 assists, and 3 rebounds. Gudmundsson looked very composed, only turning the ball over twice, and making all four of his free throws. The freshman from Grindavik, Iceland gives Davidson a different look from the point guard spot than they’ve had recently. After several years of Jack Gibbs and Brian Sullivan, two smaller guards that shoot the ball really well, Gudmundsson is an athletic guard who can create off the dribble. I thought he looked best in transition, when he could improvise and take the ball straight to the hoop. Gudmundsson’s ability to function in Davidson’s half-court set will only get better as the year goes on, but for now, the Wildcats have an exciting 6’4” guard who can get to the rim, draw fouls, and make his free throws. The 5:2 assist:turnover ratio is another encouraging sign – Jon Axel Gudmundsson’s early impact bodes well for Davidson’s depth as the season progresses. While Gudmundsson is the only true freshman this year, Davidson finally got to pull the redshirt off of three other players. 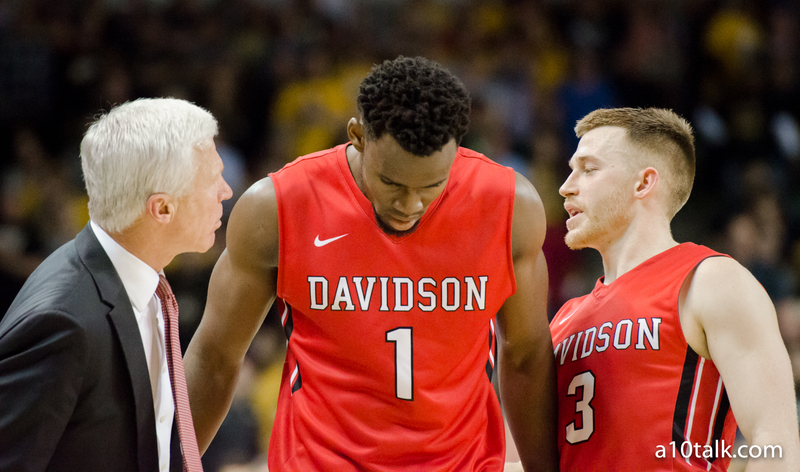 I remember writing an article sometime around February of last season when Davidson was in the midst of an injury crisis about how many players they were missing, which included their two freshman, who were both sitting the year out, along with a transfer. Well, now all three of these guys are back, and the early returns are encouraging. Davidson’s size has gotten a big boost from this process. Will Magarity, a 6’11” transfer from Boston College, has started Davidson’s exhibition and opener in the post. Magarity, who can stretch the floor and hit some threes, has been supplanted by redshirt freshman Dusan Kovacevic. Kovacevic, a 6’10” big man out of Novi Sad, Serbia, logged 11 minutes in the Wildcats’ opener. The most exciting debut in the eyes of some Davidson fans might have been that of guard KiShawn Pritchett. Pritchett is a 6’6” 230lb guard who I think will turn into Davidson’s version of a Swiss Army Knife. Able to play almost every position on the floor, Pritchett will give Davidson a boost in numerous areas, including rebounding, assists, and defense. Though this is all just through one regular season game, the early returns are good for the Wildcats. For a team who had no new contributions the year before, there will be some growing pains as Bob McKillop rotates and tinkers to try and find the best lineups and positions for his various new tools. However, the future, which is a deeper, taller, and more athletic Davidson, looks bright.